Home » Nighthawk » Pictures » Easy CG feathers? YOU GOT IT! This is my first tutorial. I hope it's helped you create many marvelous and magnificent feathers to be used in you future work. ^__^ It's really quite easy once you get the hang of it. No joke! What are YOUR thoughts on this tutorial? That kind of wing just from one single feather? O.o just amazing and useful! wow!! this helps so much!! ^_______^ brilliant! The feathers look so soft and cuddly. X3 GJ. I managed most of it on PaintShopPro7 but which program did you use? Good tutorial though. Thanks! Very, very nice ^^ I'll be sure to use this! Wow! O_O Thank you! 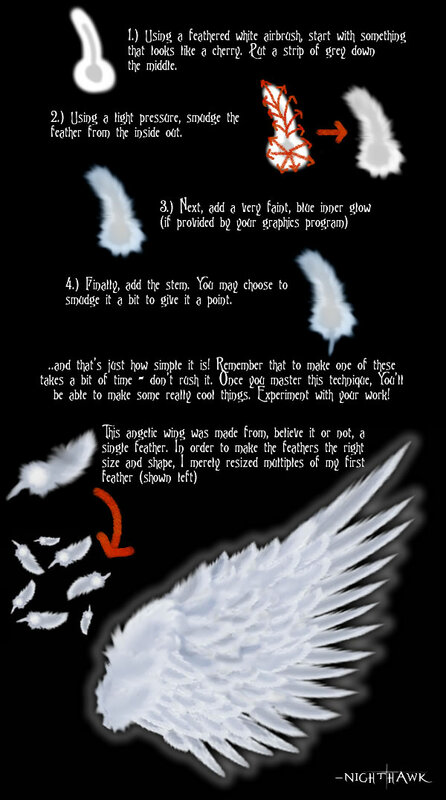 This will be VERY helpful for a few of my upcomming pictures!